If you've heard anything at all about the latest Super Mario Bros. game, you know that it has a lot of coins. So many coins. The diligent player can collect a million of the shiny little guys. 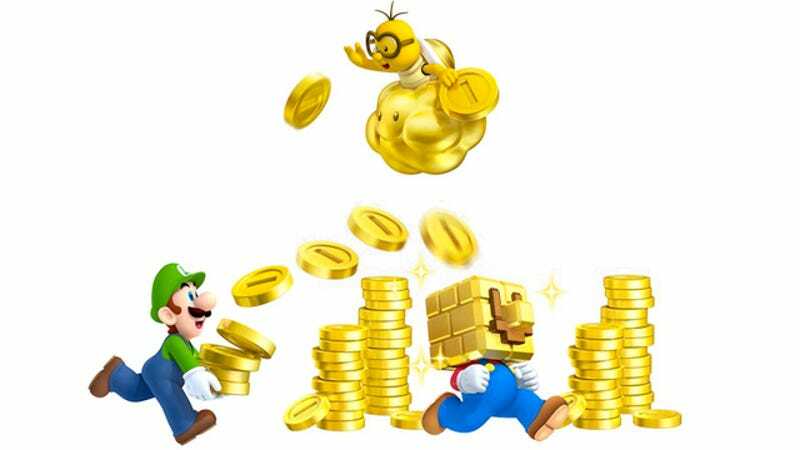 An article over at Scripted Sequence ponders whether the ongoing inflation of coins in Mario games has led to a decrease in their value, and, to the author, a decrease in overall enjoyment of the game. Which brings us to the ‘New' series, starting with New Super Mario Bros. on the DS, through New Super Mario Bros. Wii and on to last week's release. Even before this latest edition, coins were much more numerous. There is no fist-pumping when you reach 100. You'll tot up extra lives without even realising it. By their proliferation, coins, and life, become cheap. There are new iterations too. Long trails of blue coins you have to rush to collect, awkward to reach red coins that offer a prize if you grab them all. Most importantly, and a key feature of the ‘New' series, are the ‘Star Coins', of which there are three on each level. Finding and collecting all of these gives the player the most profound satisfaction, even greater than story completion, even if they do very little. Simply put, the journey becomes more important than reaching the destination. Clearly the coin has reached its zenith with New Super Mario Bros. 2. Its time has come. There are so many in this game they become an almost inane feature, a slapstick overload as they fly from every direction and constantly rack up on your scoreboard. It's certainly true that an individual coin means less in New Super Mario Bros. 2. While that doesn't really diminish my enjoyment of the game, it is an interesting thought: As games do more, more, more, eventually that will mean less and less. It happens in western games all the time; it could certainly happen to Nintendo.